Christmas. It’s the most wonderful time of the year! The tree is decorated with favorite ornaments collected from travels around the world. The presents are wrapped with Pinterest-perfect bows. The Christmas letter tells the multitude of recipients how successful little Johnny was at the spell bowl and how Susie led the volleyball team to the state championship. The family picture is adorable by the fireplace with Rosco obediently laying his paws at just the perfect angle. The house looks like Martha Stewart just left and the kitchen smells of freshly baked Christmas cookies! PHEWWWWY!! Who has all that??!! No one. Nothing is that perfect. Cats get in trees and ornaments break; cookies burn; the family picture shows the aggravation of the itchy sweaters and usually the lights have a portion in the middle of the strand that burn out AFTER they are placed on the gutters. I love Christmas and the decorations and the sweet spirit that surrounds this time of year but we have to remember that our pursuit of Pinterest® perfection can take away our joy of the season. What we should be celebrating is the baby that was born over 2000 years ago in a dirty barn with animal slobber and itchy straw. The manger and stable weren’t Pinterest-perfect for the King of the World. Why should we pursue it for ourselves? As you prepare for the most wonderful time of the year, don’t lose site of the only reason we have a holiday called Christmas to celebrate. Relax. Remember the manger in the barn with the baby wrapped in rags and a single bright star announcing His birth. Christmas really can be that picture-perfect. 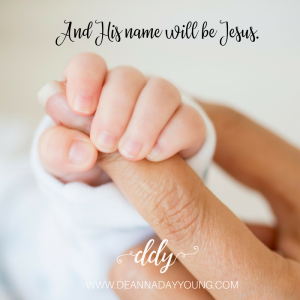 This entry was posted in devotional, inspirational, motivational, spiritual on November 29, 2017 by Deanna Young. The latest craze for a pregnant couple is to have a gender reveal party announcing to family and friends (and Facebook) whether the expectant momma is having a boy or a girl. There are many creative ways to make this announcement – pink or blue cream-filled cupcakes; a release of either pink or blue balloons; candy bars wrapped in pink or blue paper; the swing of a golf ball revealing pink or blue powder. These celebrations to reveal the gender of an unborn baby can be quite elaborate. It’s interesting though that the gender reveal announcement of the greatest birth of all time was actually quite simple. *No cupcakes were needed. Just an angel with a message. *No sonogram was taken. Just a virgin with child. *No public celebration. Just Mary and Gabriel. What a simple way to reveal the gender of the most precious baby sent to save an entire world! This entry was posted in devotional, inspirational, motivational, spiritual on November 28, 2017 by Deanna Young. In the original Christmas classic, Rudolph The Red-Nosed Reindeer, Rudolph visits a land of misfits where everyone is very unique but feels as though they don’t fit in with the rest of what the world deems “normal”. As I’m sure you know the story line, Rudolph’s misfit nose saves Christmas and becomes the icon to lead Santa’s journey every year since. It seems what made Rudolph different is also what made him stand out for good. The Bible tells us in Romans 12:2 that we are not to conform to this world but rather be transformed by the renewing of our minds. In other words, we are to be misfits in this world as we stand out for Christ. It’s when our Christianity shines brightly that we are able to lead this world of negativity back to the light of Christ. So don’t worry that you don’t fit in with this world. God created us to be misfits – misfits for Him. Won’t you join me in the Misfit Movement this year? 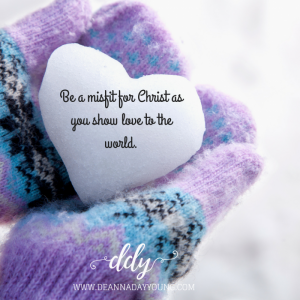 This entry was posted on November 26, 2017 with tags: #kindnessmatters, #makeadifferenceeveryday, #misfisforChrist by Deanna Young. As we focus on our blessings over the next couple days, I encourage you to think about starting a Gratitude Journal. I talked to a friend who has been writing down each down something she is thankful for. She told me that the longer she does it, the more she starts seeing God in the little things. I loved it! Maybe if we all start seeing God more in the little things, we can truly make a difference to this world and this “gratitude thing” will be contagious! Give thanks. Be grateful. Praise the Lord for it all! 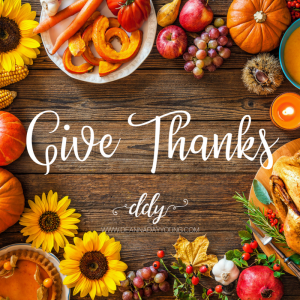 This entry was posted on November 22, 2017 with tags: #givethanks, #grateful, #makeadifferenceeveryday by Deanna Young.